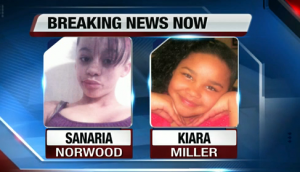 11 year old Kiara Miller and 13 year old Santaria Norwood have been missing since Saturday afternoon, July 27, 2013 in Milwaukee, Wisconsin. The two girls were last seen at 6:00 pm heading to play at Washington Park Saturday afternoon. The girls showed up at Kiara’s home, in the 4400 block of W. North Ave., at 6 p.m. and asked to go back to the park. Before they were allowed to walk off again, her mom gave Kiara a curfew of 8 p.m. However, they never returned home following their 8:00 p.m. curfew. Kiara Miller’s mother searched the park with a car and checked at Norwood’s home but couldn’t find the girls. Kiara’s mom, Vanessa Moralez, reported them missing at 12:21 a.m. Sunday. Kiara is 5 feet 1 inch and 145 pounds, has curly shoulder-length black hair and lives in the 4400 block of W. North Ave. She was last seen wearing a pink Abercrombie & Fitch zip-up sweater, blue jeans and Nike tennis shoes in gray, white and pink. Sanaria, who also goes by the nickname Ri-Ri, is 5 feet 1 inch, 90 pounds, has short curly black hair with blond highlighted tips. She lives in the 2500 block of N. 39th St. She was last seen wearing pink and white pajama pants, a purple tank top and a purple Gucci sweatshirt. UPDATE I: One girl has been reportedly found … Kiara L. Miller has been found safe. Milwaukee police reported late Sunday night that one of two missing middle-school girls had been found, and they were hoping to have information on the other soon. The girls had been missing since 6 p.m. Saturday. Kiara L. Miller, 11, a sixth-grader at Waukesha Middle School, was reported found. She was safe and police were talking to her just before midnight. No information on where she was found was available. Her friend, Sanaria R. Norwood, 13, an eighth-grader at Roosevelt Middle School, remained missing as of midnight. If anyone has any with information regarding Kiara Miller and Sarina Norwood, please contact Sensitive Crimes Division at 935-7403.